A well made insect house like one based on our designs is undoubtedly a good thing, but it won’t magic those mini-beasts into your garden all by itself. 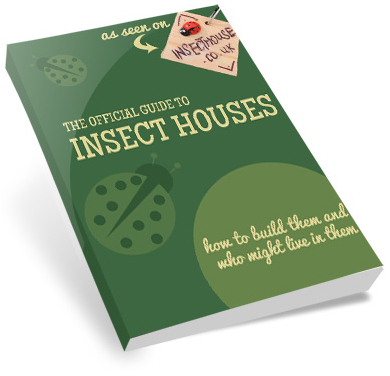 In order to do that, you’ll need to site your insecthouse in the right place. You could fix your insect house to a fencepost or tree, in which case your stylish abode will mainly attract fliers. Or you can sit it down on the ground where it will also tempt earth-bound species. Either way, put it somewhere sunny and sheltered and, if it’s on the ground, somewhere dry – in a well drained flower bed or on a paving slab. For best results surround your insecthouse with invertebrate-friendly flowering plants. Gardens are over sanitised these days so turn over a part of your garden to native species, let the weeds run riot in a corner and you’ll be amazed by the results. And plant lots and lots of flowering species – a few rows of beans, some herbs, a couple of shrubs will all have beneficial polinating insects flocking in from (literally) miles around.